﻿ Room Rates of National Jade Hotel Beijing, Pay at the hotel reception upon check- in, Registration and Credit card are NOT required for booking! 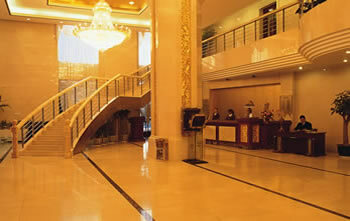 We provide National Jade Hotel Beijing room booking at lowest price! National Jade Hotel Beijing have 192 rooms of various sets of bed room, including standard room, business room, standard suite, etc. All room are equipped with air-conditioning, IDD, DDD, satellite TV channel, mini bar, and so on. bedding based on the scientific design of the human body, to provide broadband Internet access and business travel required for the necessary facilities. 28 square meters of exquisite space, Single Room with a queen-size bed(150cm*200cm). Room rate includes single or double occupancy. High-speed internet Charges. Non-smoking available. 30 square meters of exquisite space, Standard Twins Room with twins beds(120cm*200cm). Room rate includes single or double occupancy. High-speed internet Charges. Non-smoking available. 34 square meters of exquisite space, Business Double Room with a king-size bed(200cm*220cm). Room rate includes single or double occupancy. High-speed internet Charges. Non-smoking available.No add Extra bed. 46 square meters of exquisite space, Standard Suite with twins beds(120cm*200cm). Room rate includes single or double occupancy. High-speed internet Charges. Non-smoking available.No add Extra bed. 82 square meters of exquisite space, Business Suite with a king-size bed(200cm*220cm). Room rate includes single or double occupancy. High-speed internet Charges. Non-smoking available.No add Extra bed. * Extra bed is RMB100(USD15)per bed per night. © Copyright ©2003-2013 WWW.NATIONALJADEHOTEL.COM. All Rights Reserved.